Add Greens to Your Plate! Spend Easter with Concentrics Restaurants. Click here for details! Give the gift of Concentrics! Purchase a gift card from Oct 1 - Jan 31 and for every $100 we will give you $20! Happy Holidays! 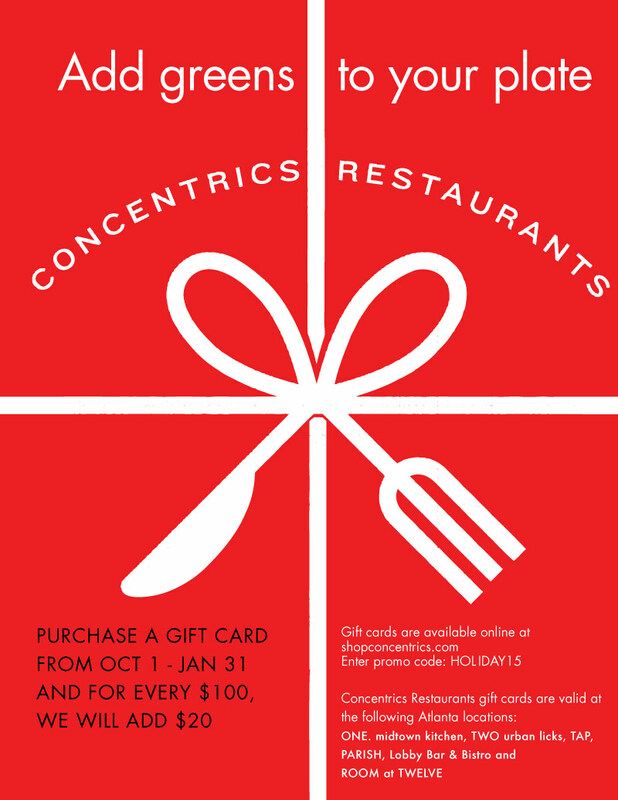 Treat the Concentrics Gift Certificate like cash at any Concentrics Restaurant. Click here to purchase yours today! Whether an event for five or 500, Concentrics Restaurants can accommodate the needs of any group or party. We offer a wide variety of cuisine, an eclectic mix of drinks and highly trained service staff to ensure flawless execution of your event. With our innovative concepts, Concentrics works with you in tailoring your events, from lunch to wine tastings and pairings, cooking classes, cocktail mixology tutorials, birthday parties, wedding events, showers and much more. We also offer catering services, and can provide everything needed for a successful event in the space of your choice. For more information on a special event or hosting a buyout, please contact us at 404-500-8731 or jnash@ctrxhs.com.